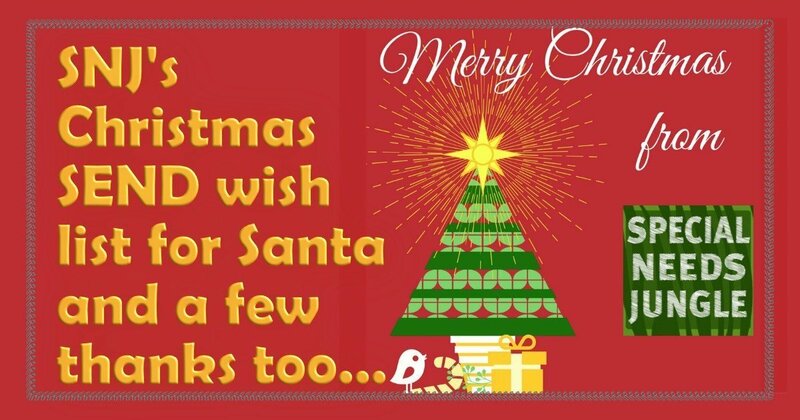 It's an ambitious wish-list and I'm not sure Santa has the ability to deliver, but I just thought I'd ask, anyway... Do add your family's SEND wish-list in the comments and also, as I am about to, feel free to write your thanks to someone you know who has made a difference to you this year. This is our last post of the year, although we'll be sharing on social media some of our favourite posts from 2016 over the Christmas holiday. Thanks for all your support this year. Thanks to my co-director, Renata Blower for being there to listen and guide and for being a wonderful friend. Thanks to another friend, Angela Kelly, our Mental Health Editor, for her continual support with social media posting and her brilliant posts that have helped so many people. Thanks to our fabulous columnists (in no particular order), Helen & Liz who write as SpeechBlog UK, Hayley Goleniowska, Marguerite Haye who has also been out and about with me at events this year. Marguerite also answers our EHCP Clinic questions along with Helen Gifford, Barney Angliss, Bren Prendergast, Mr Boo's Mum, Matt Kerr, who has also spent much time distilling our Code of Conduct campaign responses (more on this in 2017), Zoe Thompson of Bright Futures School for her fascinating series with Guiding (more to come in 2017 too), Malcolm Reeve, Beth McCleverty of Genetic Alliance UK, Robert Pleticha of RareConnect, to Nicky Goode, our book reviewer and to Charlie Mead (currently missing, last seen on the golf course). Thanks also to Julie Moktadir at IPSEA, for our Ask IPSEA feature and to those who have contributed guest posts during the year that have helped make the site so diverse in what we can cover. A final thanks to Debs Aspland for her three+ years of work and help with SNJ. If you have grant application experience and time to volunteer and help us, do please email me. Our thanks go most of all to you all for reading, commenting, sharing and coming back to do it all again, post after post. Without your support, our information and features would not find half as many parents and practitioners as they do. THANK YOU! Have an amazingly blessed, peaceful and happy Christmas and I hope 2017 brings all of us joy, laughter and GREAT OUTCOMES for our children! 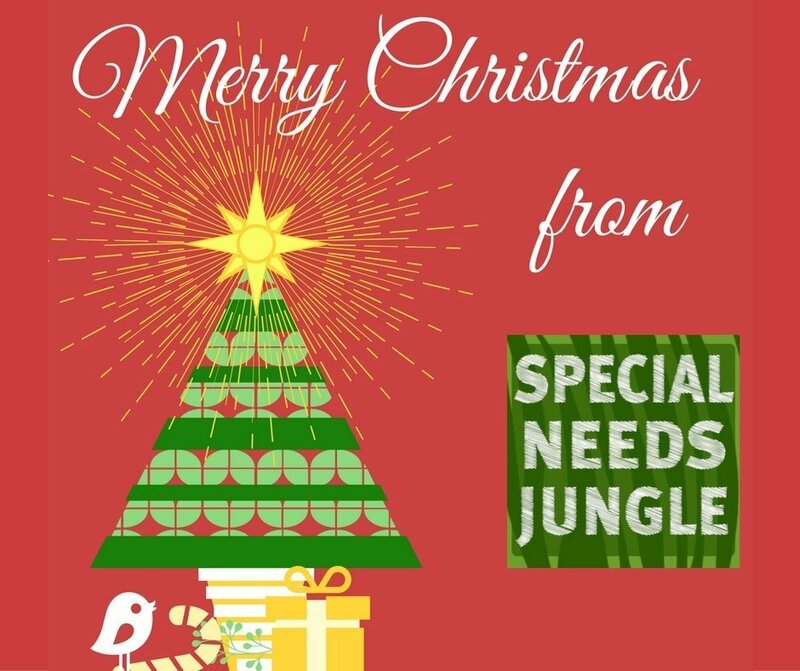 Santa, I would like my Local Authority to understand what inclusion means and how to promote it so that a disabled child can function as a part of the community they live in. If this means Santa that you have to take a little longer to deliver this present we will understand, we have learnt how to wait having had much experience of having to do so. If you could help our LA to learn how to communicate then that would be a star present too. Finally Santa if you coukd find the missing ten million that our borough council lost in a loan to their pals at the football club then you could use this money to provide the presents on this list perhaps? I know you aren’t a miracle worker but my final request would be that the SEN officers are given the gifts of honesty and integrity this Christmas to share with all the children and parents they work with next year. That will save so many SEND tribunals being held and will hopefully be the impetus that some dodgy lawyers need to move them on from the SEND world as they aren’t all going to openly tweet about their shortcomings so we can’t rely on that. That’s an excellent list, I must add it to my own! Thank you so much for such kind words. I only hope that 2017 brings our wishes true and I am no longer needed and can move on and do other things! Would be nice Tania but I’m still booking tickets for my next tribunal in the new year. It’ll be number five and my son is only ten!! Will happily miss the show if wishes do come true!!!! And you too and am looking forward to your first column in 2017!